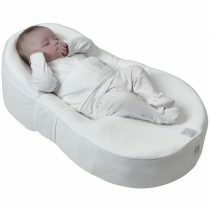 This soft, comforting cocoon offers the perfect transition between the womb and the outside world by keeping your baby in a semi-foetal, slightly curved position, which promotes relaxation and restful sleep. It’s ideal from birth to three or four months, when baby starts to roll and turn over. The Cocoonababy Nest helps both babies and new parents to feel comfortable and confident in those bewildering early days. Many parents who use this innovative bed find that their baby sleeps for longer. The soft outer cover, the waterproof sheet and the tummy band are all machine-washable. Another feature of the Nest is its tummy band. This band puts slight support on the baby’s abdomen, helping them to feel even more secure. It doesn’t restrict their movement, it’s just like a comforting hand on their tummy. 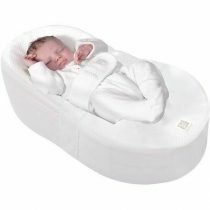 The Cocoonababy Nest helps to keep babies on their back to sleep, which is recommended by all medical experts. Its softness can also help to prevent flat-head, reduce the startle reflex (which can wake babies up unnecessarily) and reduce reflux symptoms.